PRP therapy for hair loss is a new non-surgical option for natural hair growth and stimulation and it is being considered the best medical treatment for hair loss since Propecia. Lorei Medical Spa in Weston is proud to introduce the latest advance in the hair loss (alopecia) treatment for men and women, PRP or Platelet Rich Plasma. Our blood is made of aprox 6% platelets, when these platelets are activated they will release healing proteins called Grow Factors. 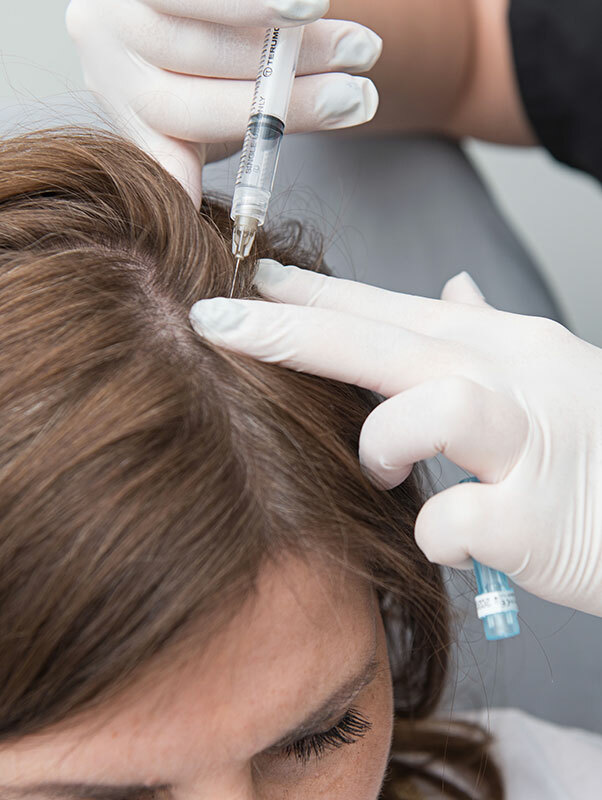 The benefits of Platelet Rich Plasma lies in decreasing the count of red blood cells and increasing the platelet count by 94% which at the same time will increase the release of more grow factors that have a positive effect on hair growth. The procedure is very simple and it is completely done at our office in aproximately 45 minutes. We first draw your own blood (like on a blood lab sample), centrifugate the blood to separate the platelets, activate these platelets with chemical agents and then inject it in the areas of hair loss concern. The treatment is complemented with an at home use of a prescribed shampoo and lotion. The initial protocol consist of 2 PRP treatments with the second one been applied 3 months after the first. During the 3 months between treatments you will have 2 supplement treatments of nano-rollers to stimulate blood circulation on the scalp and at the same time apply a special product to enhance the results. Call or contact us for your free consultation and our Doctor will explain in detail the best protocol that work for you.